Which Pans Are Suitable for Ceramic-Glass Cooktops? Ceramic-glass cooktops offer some key advantages over traditional electric burners, such as their sleek appearance, easy-to-clean surface and quicker heat-up time. 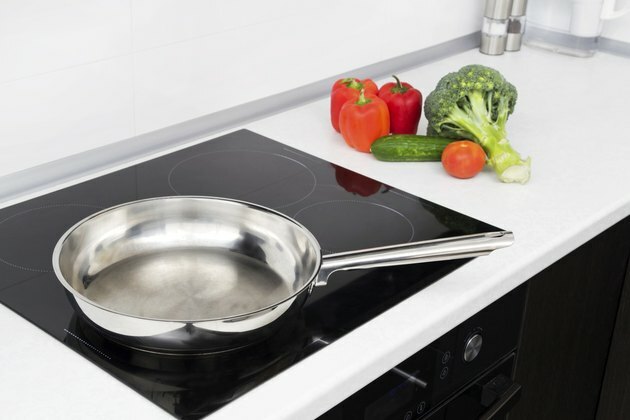 Most types of cookware can be used on a ceramic-glass hobs, although there are some differences to consider. On the plus side, some pans conduct heat more efficiently than others. On the minus side, certain types of pans pose a greater risk of damaging the smooth cooking surface. The decision of what pans to use, though, will largely come down to your personal preference. Pan on ceramic glass counter. Pans made from any type of metal that conducts heat well are generally suitable, with a few exceptions. According to ceramic hob manufacturer Miele, glass, ceramic and stoneware pans are not suitable for use on a ceramic glass cooktops because they are not good conductors of heat. Aluminum and aluminum-based pans will work with a ceramic hob for your cooking needs, but they have a tendency to leave marks on the hob. These marks can be cleaned up, but the extra maintenance involved is not ideal. Some types of ceramic-glass cooktops are induction hobs, which transfer heat directly to a pan using a magnetic induction coil. Put simply, the cookware placed on the hob will heat up, but the ceramic surface itself does not. If you have a ceramic-glass induction hob, you need pans made of a magnetic metal such as cast iron or steel. Copper, aluminum and tempered glass cookware will not heat up because they are not magnetic, making them essentially useless on an induction hob. Your pans need to have a flat, solid base so that they can sit steadily on the perfectly flat surface of a ceramic-glass cooktop. Pans that wobble are not only hazardous, they are also inefficient, as heat from the element will escape from underneath them. Some pans have a base that is slightly concave when cold, but flattens when hot. If you own pans that appear to have this kind of base, test them on your cooktop and see if they flatten out – if so, continue to use the pans; otherwise, do not. Avoid using pans that have a ridged base, as they are likely to permanently scratch the ceramic surface. The size of the pan base is another consideration. Don't use a pan so large that it extends beyond the ceramic hob surface, or one so small that the heating element is not completely covered. Because a ceramic hob resembles glass, you may be worried about cracking it with heavy, solid pans. However, the surface is not actually glass and is sturdier than it appears. You should always move pans directly up or down on your ceramic-glass cooktop rather than sliding them, which can cause scratches. This means that you need pans that are light enough to lift safely when filled with hot food. A large cast-iron pan, for example, may be too heavy to sensibly use with a ceramic hob. Select pans with a good balance between sturdy construction and a lighter heft. What Type of Cookware to Use on a Smooth-Top Range?